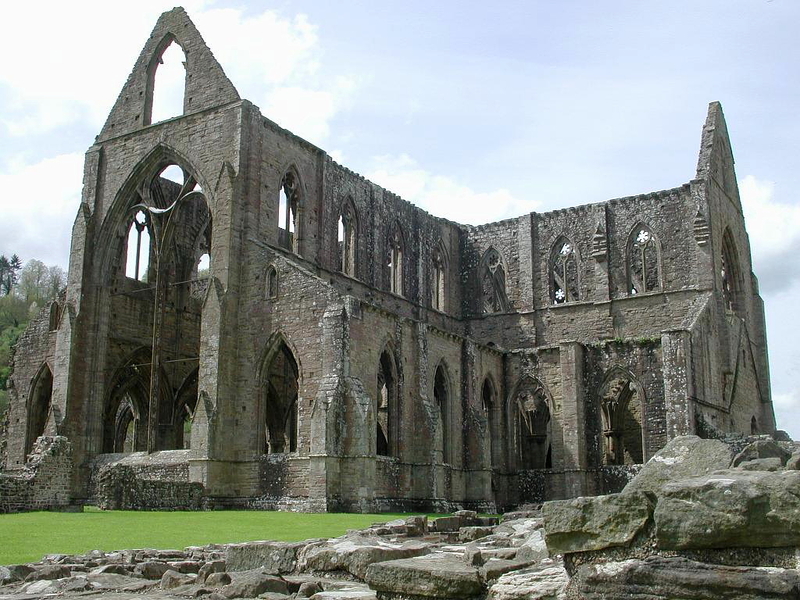 There is a legend regarding Tintern Abbey told in two books: Frederick Ross’s book, The Ruined Abbeys of Britain, and William Beattie’s book, The Castles and Abbeys of England. According to the legend, a group of young men had come to see the Abbey and decided to employ several laborers to dig in the orchard that adjoins the Abbey to see if they could discover some antiquities. They apparently discovered the remains of two human skeletons and decided to celebrate their discovery by having an evening feast held within the ruins of the Abbey (Beattie 108). As the men seated themselves on the grass within the Abbey and began to make jokes about what the monks rising from their graves would think of their revels, there appeared rapidly darkening skies with lightening striking all around followed by thunder that seemed to shake the surrounding hills (Ross 23). It grew darker and a mist seemed to shroud the ruined walls, columns, and empty windows of the Abbey. The men saw a gleam of light in the mist that appeared at the entrance to the choir; as it seemed to grow in size, it assumed the outline of a mail-clad knight with the visor of his helmet raised (Ross 24). Slowly hazy figures of cowled monks and mitered abbots began to take shape around the knight as the revelers sat frozen on the grass in horror. Each man there knew in his heart that he had disturbed the rest and peace of "Strongbow," (Gilbert fitz Gilbert de Clare, earl of Pembroke), and of the Cistercian monks who had been granted Tintern Abbey by Walter de Clare in 1131 (Cooke 667). Suddenly, there was a pause in the storm raging over the Abbey. The mailed figure of "Strongbow" fixed his eyes on the petrified strangers, slowly raised his gauntled hand, and pointed to the doorway of the Abbey with his sword (Ross 24; Beattie 110). The previously daring and jovial adventurers sprang from the grass and fled from the Abbey in all directions. As they ran, they saw behind them a small whirlwind that seemed to swoop over the ruined walls, gather the remains of their feast from the grass, and fling it far and wide beyond the Abbey ruins (Ross 24; Beattie 110). There does not appear to be any written record of when or where this legend began; it is simply a part of the folklore that is attached to Tintern Abbey. It could possibly date back to Elizabethan time or be as recent as the 1700s or 1800s. Whatever the origin of the story, it is not difficult to imagine a group of young men, somewhat in their cups, thinking that it would be a lark to have a convivial feast on the remains of the floor of an ancient monastery. Nor is it difficult to "see" that the spectral figure of a mailed knight appearing from the rain and mist would instantly restore sobriety and instill fear and respect in that group of revelers. This tale-whether based on a true incident or merely folklore-adds a touch of whimsy to the history of the beautiful Abbey of Tintern. Beattie, William. The Castles and Abbeys of England From the National Records Early Chronicles, and Other Standard Authors. London: Virtue & Co., 1184-5. Cooke, Alice M. The Settlement of the Cistercians in England. English Historical Review 8 (October 1893): 627-76. Ross, Frederick. The Ruined Abbeys of Britain: Illustrated From Drawings by A.F. Lydon. London: William Mackenzie, 1882. Ms Armstrong has Master's degree in Professional Writing from Kennesaw State University in Atlanta, Georgia . Her field is medieval English history. 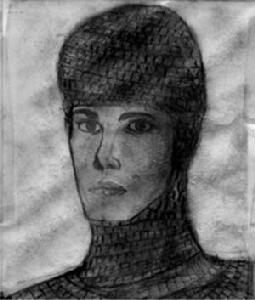 Her specific field is William Marshal, his fiefs and "familiares". Her concentration is on the lands and people bound to Marshal by blood and marriage, by feudal tenure, and by "affinity". She can be reached via e-mail at: seneschal@peoplepc.com.